Kinyei Café provides high quality, specialty coffee for customers, and provides travelers, expats and locals with a safe space to collaborate and hold workshops. In 2015 Kinyei International entered a joint partnership with Feel Good Group, a local specialty coffee roaster sourcing locally from Cambodia, Laos, and Thailand, to maximize impact. Feel Good is the operational partner in Cambodia, while Kinyei International remains an active board member. At Kinyei Café we pride ourselves on offering expert coffee training for our team, and serving exceptional coffee to our customers. 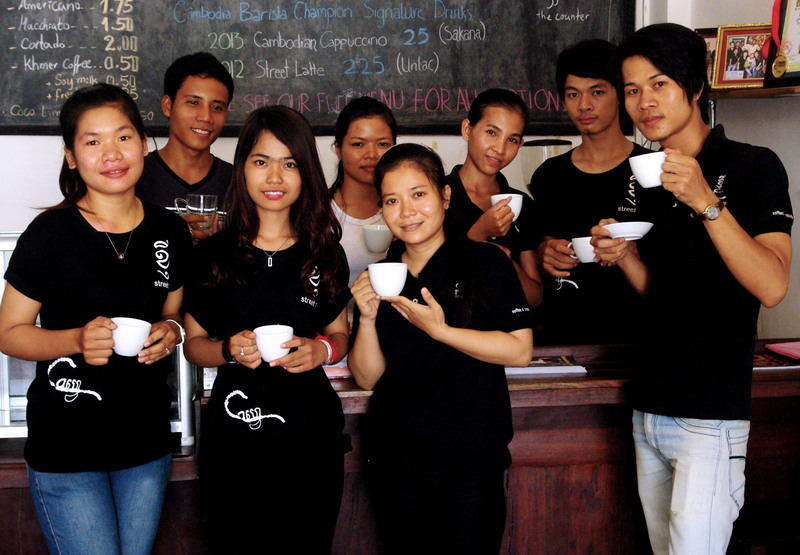 Two of our baristas have won Cambodian National Barista Championships in 2012 and 2013, and have represented Cambodia in international competitions. Want to see what all the fuss is about? Come in and try the “Street Latte” and “Cambodian Cappuccino” and you’ll be a believer. “Cafe” in Cambodia as in much of the world means more than just coffee. It means a place, open to everyone, where you can go to share – ideas, news, culture. Kinyei Café, more than just a place to buy a drink, will serve as a platform for the emergence and development of ideas, businesses, music and art. Drawing on our experience with Open Space Technology and social project facilitation in Cambodia, Kinyei is creating Kinyei Café as a profitable, thriving hub of social innovation, cross cultural engagement and local artistic talent. Kinyei Café is located on Street 1.5, right next to the town’s central market. The Café comprises two floors and the comfortable balcony of a French colonial era townhouse. The establishment has an open, modern warehouse flair unique in Battambang. Kinyei Café serves expertly made espresso coffee and a small, tasty menu of savory items and baked goods. We work with local artists to line the walls with fresh artwork to showcase Battambang as the art hub that it is. Pingback: Kinyei Café - coffee in Battambang Cambodia | Fancy a Cuppa?